Nielsen E, Christoforidis S, Uttenweiler-Joseph S, Miaczynska M, Dewitte F, Wilm M, Hoflack B, Zerial M. Rabenosyn-5, a novel Rab5 effector, is complexed with hVPS45 and recruited to endosomes through a FYVE finger domain. J Cell Biol. 2000 Oct 30;151(3):601-12. VPS45 polyclonal antibody ( Cat # PAB6508 ) staining ( 0.3 µg/ml ) of human PBMCs lysate ( 35 µg protein in RIPA buffer ) . Primary incubation was 1 hour. Detected by chemiluminescence. VPS45 polyclonal antibody ( Cat # PAB6824 ) ( 0.03 µg/ml ) staining of human placenta lysate ( 35 µg protein in RIPA buffer ) . Primary incubation was 1 hour. Detected by chemiluminescence. 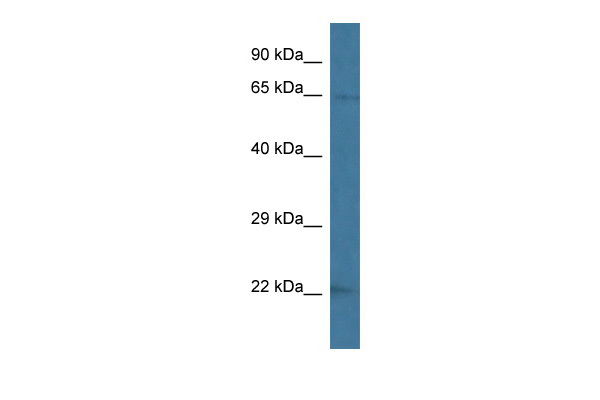 Western Blot analysis of VPS45 expression in transfected 293T cell line (H00011311-T01) by VPS45 MaxPab polyclonal antibody.Lane 1: VPS45A transfected lysate(62.7 KDa).Lane 2: Non-transfected lysate. VPS45 Antibody (C-term) (AP54516PU-N) western blot analysis in mouse brain tissue lysates (35 µg/lane). This demonstrates the VPS45 antibody detected the VPS45 protein (arrow). TA302901 (0.3µg/ml) staining of Human Peripheral Blood Mononucleocyte lysate (35µg protein in RIPA buffer). Primary incubation was 1 hour. Detected by chemiluminescence. TA303041 (0.03µg/ml) staining of human placenta lysate (35µg protein in RIPA buffer). Primary incubation was 1 hour. Detected by chemiluminescence.